Work for “Playing John Cage” Exhibition. Arnolfini Gallery, Bristol, UK. Media : red leather chaise longue, suspended deciduous winter branches. I am considering a future with no recorded music. In the summer, I was improvising with the Merce Cunningham Dance Company for three nights. Each night with two other musicians I had never played with before, following an instruction to take our own paths and not play together for the seventy-two minutes duration. Each night unable to see the dancers performing a different choreography on a stage above our heads, with each night a different décor. Each night, the audience only became visible when we stood formally to receive their rapturous applause as Merce appeared. It was on the second night that I had this incredible feeling, this is it. This is the way to do it. Here we are, making this music together for the first time, out into this space as these dancers are making their movements that we can’t see, and the only people witnessing the whole are all those people out there, all those individuals in that big carpeted space, sitting en masse, silently pulling together these collisions as moments of information, now and now and now; assimilating their own meanings and stories, subconscious or otherwise, through all their varied perceptive mechanisms. And this will never come again, and neither can this be captured or repeated or documented in any way. This is living. I write this as my neighbour’s morning jazz filters through behind, the traffic weaves soft lines down below, a studio sharing colleague flops past in sandals and the tap tapping of my fingers pops rhythms into that heavenly descending aeroplane tone that regularly falls. This moment of music that you feel through vibrations of the air, this air that enables us, will never come again. THE MAKING OF CHAISE AND THIS IS FOR YOU. To Martin Clark at Arnolfini Gallery. August 2005. 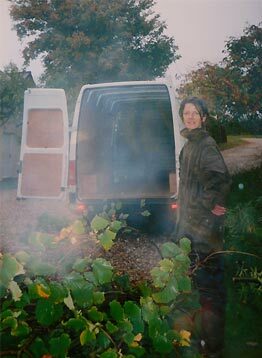 Dear Martin, Hi, I am making one of the works for the john cage show that David is curating, and so I’d love to come and make a site visit if possible next week. Essentially I need to get a sense of the dB level of the surrounding area, and a sense of the layout of the show and the intended location of my piece. I think I will be making a quietly vibrating chaise longue, as a means of listening to the other works in the exhibition, so need to get an idea of size, resonance + acoustic of space as well as cable throws required etc. Do you have information on the other works you could send me please? I know there are several that are headphone pieces, but there are also pieces whose sound is happening in the space yes? It would be good to get a sense of those. David has given me some idea, but an understanding of how they are delivering their sound would be good., Hope this is clear. Looking forward to hearing from you. From KM to DT, September 2005: ok, so from what I understand, altogether it will be a pretty quiet group sound show. great. i am not going to do arnolfini visit next week now as it seems i have to go there in october, and time is kind of tight too right now eh? 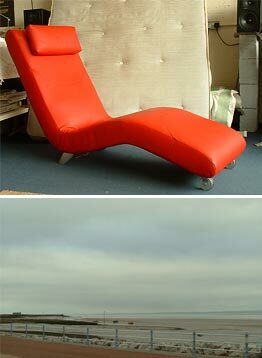 it would be good to know though where you might like chaise to go in the space ? if poss it would be great to have it in the middle somewhere rather than against a wall, as although it will vibrate, its ear listening for sitters will be from the room itself. does that make sense? I go to Morecambe, Lancaster tomorrow to fetch some vibracoustic speakers at the weekend. I have reconnected with an old colleague from my York days, Gordon Delgarno who has reappeared out of the ether through my bioresonance research for this music for bodies project. He’s a physicist and has been doing fabulous work researching and building objects and speakers to enable deaf and disabled people to enjoy and make music through their bodies. He’s largely concerned with the therapeutic so we are coming at it in quite different ways. Great how things come round. We have not spoken since I was playing and processing colour and shapes with the midi violin via an Atari 1040ST about for 15 years or so! On Oct 6, 2005, at 3.16 pm, David Toop wrote: Hi Kaffe, Hot off the press news is that the catalogue is ON; it may be loose pages in a box or jewel case, or a small book. The 16th is fine. I’ll put everything together in the few days after that, then send it to the printer. Any word on a chaise longue or do we have to go to World of Leather? 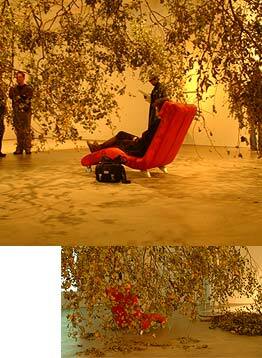 On Oct 7, 2005, at 9.36 am, David Toop wrote: Hi Kaffe, That’s great news about the chaise longue. Warm leatherette, hmmm . . . Don’t forget to keep Dave informed about what you need for the full installation. From KM to DT:17 October 2005 13:49:14 BST Hi david, hope trip was good. welcome back. I need to talk to you. i have had quite a development in the work, and it would be good to discuss if you like, OR i just send you the text and see what you think. Simply put, I want to set up a listening experience for the visitors which is about them making their own music from listening to the space, and so the other works playing within it. I want to make a stopping and resting place for them. The placement of the vibracoustic speakers in chaise gives a pleasant enough sensation but ultimately detracts from the listening. So, I have decided not to place any speakers within chaise at all. Instead it will be installed within its own space that will provide a safe private space that visitors can get into a state of stopping and sitting and being able to listen in. Possibly quite a demand in a gallery… What do you think? 1. raise chaise on a high platform above the ground so that visitors have to climb up to get there. Once raised they are out of the gaze of other visitors. 2. present a large and beautiful image of chaise in the gallery with a key and a map to another room where chaise is installed and the listener could sit and listen. 3. suspend a transparent curtain of poly-fabric/hazard ribbons/rope around chaise. 4. suspend winter branches around chaise. Option 4 was taken as 1 was problematic with cost, safety, fear and a sense of elevation produced which was not wanted. Option 2 was not possible as no available room in gallery), option 3 was irrelevant and option 4 solved the need somehow to have the chaise nested in some kind of organic materials, although I had been considering the floor as the surface to be covered, even with a text beneath it that would be revealed during the exhibition. Again the text within the actual piece was discarded as it was thought to be a distraction from the listening. Chaise, titled This is for you was opened to the public on Friday 4th November until January 20th 2006, at the Arnolfini Gallery, Bristol, UK. It was accompanied by the text, This is for you, in the Playing John Cage catalogue.